Transporting a crossbow on a UTV is a challenge---the crossbow has to be held securely and positioned for protection. The Power-Ride Crossbow Holder utilizes two, patented, unique Great Day mechanisms to attach the unit to the frame of the UTV. First, the Power-Ride mounting bracket adjusts and conforms to any style of UTV frame and the Tension-Lok holding cradles then safely and securely hold the crossbow in place. 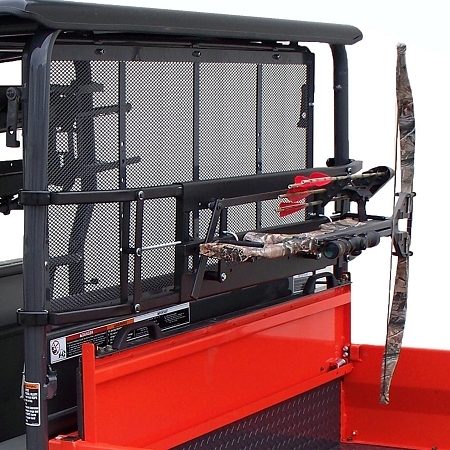 The Power-Ride Crossbow Holder attaches on the back side of the UTV frame---out of harm’s way yet easily accessible. The Power-Ride frame is constructed of aircraft aluminum and attaches in seconds with wing-knobs. The Power-Ride fits all popular brands of UTV’s. Weighs only 14 lbs.